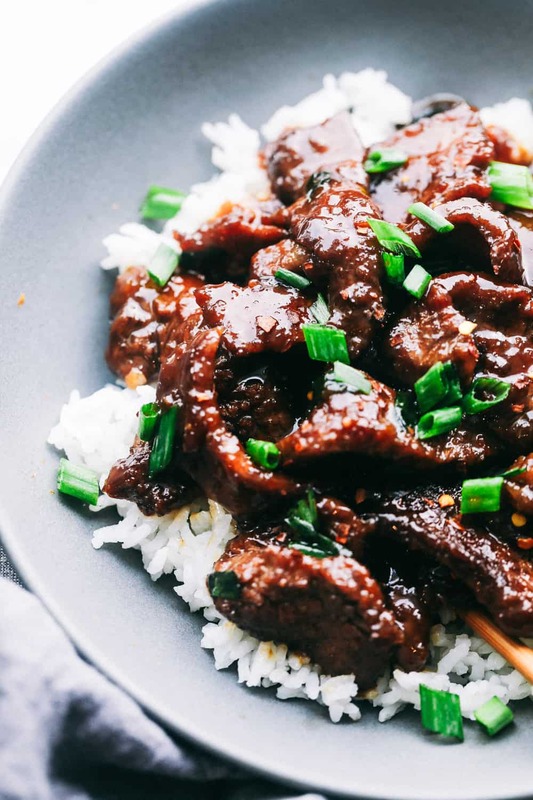 Easy Mongolian Beef has crazy tender beef with a crispy seared edge that gets coated in a bold sticky sauce. This is way better than P.F. Changs! 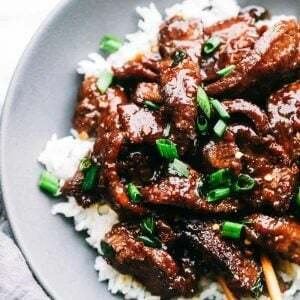 If you want to try making this in the slow cooker, we love this Slow Cooker Mongolian Beef. It is one of the top recipes on the website! 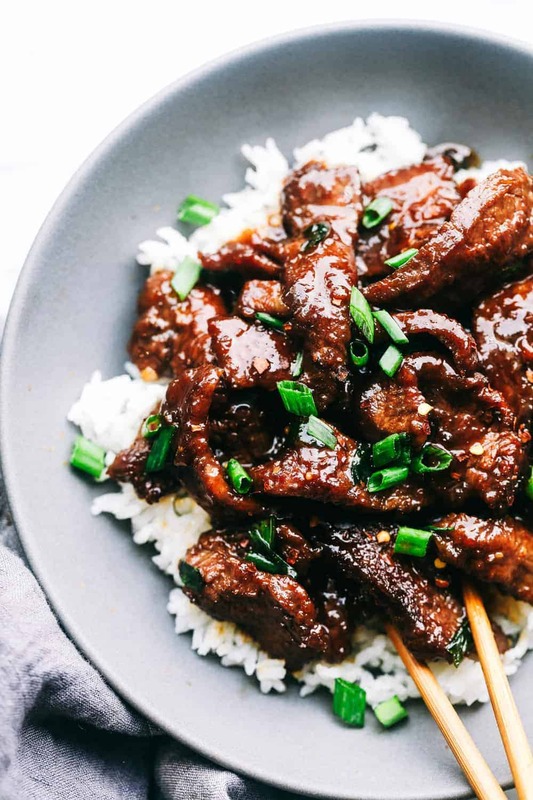 We love this Slow Cooker Mongolian Beef so much at our house. It has melt in your mouth beef and the most amazing flavor. The kids are always asking me to make it. So I knew that it was time to make an easy version that takes less than 30 minutes to make and tastes even better than….. dare I say… P.F. Chang’s!? The magic to this meal is the crispy pan fried beef that is so incredibly tender. Our family likes it saucy so it had plenty of thick and amazing sauce. The flavor is unreal. Your family is going to go crazy for this meal! In a large ziplock bag add the sliced flank steak and cornstarch. Toss the beef to coat evenly. Heat a large skillet to medium high heat and add the vegetable oil. Once heated, add the steak in a single layer and cook on each side for about a minute until the edges just start to brown. Once the steak is cooked, remove and set aside on a plate. In a small mixing bowl combine soy sauce, brown sugar, water, ginger, and garlic. Add the sauce to the pan and bring to a boil. Add the steak to the sauce and allow the sauce to thicken for a couple of minutes. Toss with the chopped green onions and sprinkle with red pepper flakes. 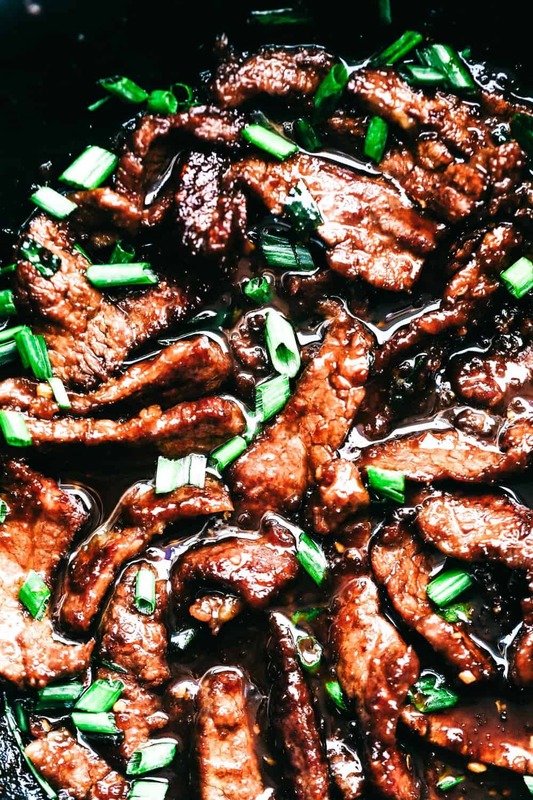 Most Mongolian beef recipes use flank steak. This can be thinly sliced about 1/4 inch thick. When you combine the cornstarch with the beef, this gives it the distinct crunch on the outside and tender inside. Slicing your beef: When slicing your flank steak make sure to slice it against the grain. I like to slice mine about 1/4 inch thick. Make sure your pan is hot: Since the beef is so thin, you want to avoid over cooking. To get that crispy edge and tender center, make sure the pan is on hot heat so that it can quickly sear the edges of the beef and leave a nice and tender inside. Don’t overcrowd the pan: In order to cook the beef evenly and quickly in the hot pan, be sure to have the beef in single layers. You may have to work in smaller batches. You do not want the meat to steam which will lose that crispy signature edge. If you want the sauce thicker: The cornstarch on the beef should thicken up the sauce, but if you would like a thicker sauce, just add a teaspoon of cornstarch at a time. What sides do I serve with Mongolian beef? Mongolian beef is great served over some rice and with a side of stir fry vegetables. Your favorite vegetable like broccoli, snap peas, etc. will make a great addition. Looking for more delicious asian inspired recipes? 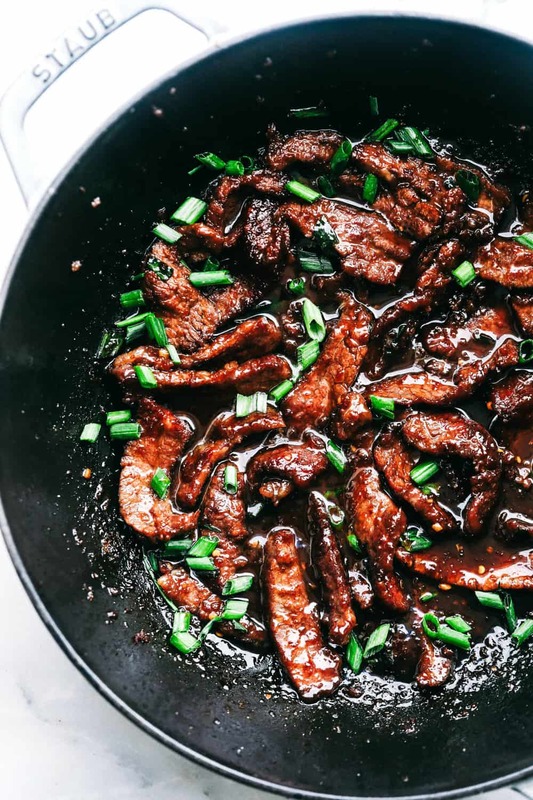 Easy Mongolian Beef has crazy tender beef with a crispy seared edge that gets coated in the most amazing sauce. This is way better than P.F. Changs! In a large ziplock bag add the sliced flank steak and cornstarch. Toss the beef to coat evenly. Heat a large skillet to high heat and add the vegetable oil. Once heated, add the steak in a single layer and cook on each side for about a minute until the edges just start to brown. Once the steak is cooked, remove and set aside on a plate. Wow, so delicious. Just like at PF Chang’s. This was excellent and so easy! My whole family loved it. Tried this last night with my family and it was just like the restaurant version! This is one of my favorite restaurant dishes and I have tried other recipes, but this one lived up to my expectations! Absolutely delicious. Another great recipe. My family has enjoyed each one we’ve tried. Please recommend a bowl or a Tupperware dish for mixing rather than a resealable plastic bag because plastic bags just end up in a landfill or waterway, whereas dishes can be washed and reused. This is going to sound stupid, but I honestly never even thought of that idea… a Tupperware container would work great! Good thinking, I agree. You can just swirl the meat around in a bowl with some cornstarch. The Tupperware bowl method is how I do it. Far more environmentally friendly than wasteful plastic ziplock bags which at best can only be re-used a few times. I just tried this recipe today and it turned out great!! The sauce was little too salty for me so I just added cornstarch and water mixture to the sauce to make it thicker and mixed with the cooked beef. I only need half of the sauce for the beef and I cooked broccoli using the leftover sauce. They both are very tasty!! I made this recipe this evening and it was delicious! Really easy to make and I followed the directions exactly! Thanks for a super recipe. Made this tonight. My son ate 3 helpings! This was delish and so so easy! Thanks! I love this recipe, so easy after work. Ladies above, I also used a glass bowl for the meal and cornstarch, so much better than the plastic , It seems to coat better. Nice. I’m going to try it soon. Thanks for sharing this recipe. Thank you for the recipe, I have one question – may I replace the low sodium soy sauce with a light, or sweet soy sauce? Or, at worst, maggi (european version of soy sauce, similar to the dark one)? Yes, either of those sounds great! I look forward to hearing how it turns out and what you love about it! Thanks for following along with me! Made this tonight. Delicious, quick and easy. Wonderful. The only adjustment I’ll make is that next time I’ll cut some scallions in 2” lengths and cook them first, remove and proceed with recipe, then add scallions back in. Thank you for a great addition to our family’s dinner rotation. FWIW I used skirt steak and it came out great. Our 16 year old won our family NCAA bracket contest and picked this for her dinner. So yummy! Thank you for a great recipe. Can this be made in crock pot after browning meat? Yes, you can make this in the slow cooker. You will want to brown the meat a bit and then let it slow cook with the sauce in the slow cooker a flavorful dinner. Enjoy! This was very quick to put together, and for the most part it was delicious – it was a substitution I had to make that made the sauce extremely salty. My daughter in law is gluten intolerant so I never have soy sauce in the house, just tamari which is the same idea but gluten free. Next time, I’ll cut the amount in maybe half and just sub extra water to replace it. Other than the saltiness the taste was good!